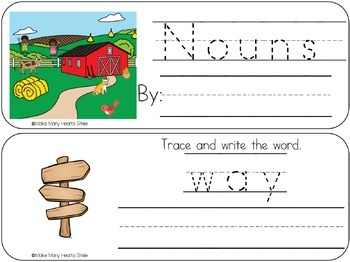 This handwriting pack is all about getting familiar with noun words with 2 half pages for each word (one in color and one in black and white). 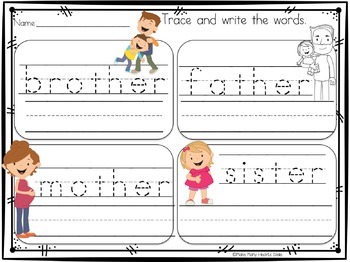 Once cut and laminated these strips make a great center activity for print handwriting practice. 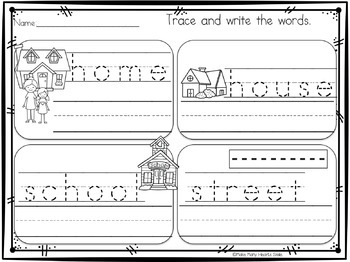 Also available 24 worksheets with 3-4 words in each and a picture for each word for the kids to trace, write and color. For the Cursive version click here. Thank you for visiting Make Many Hearts Smile!! 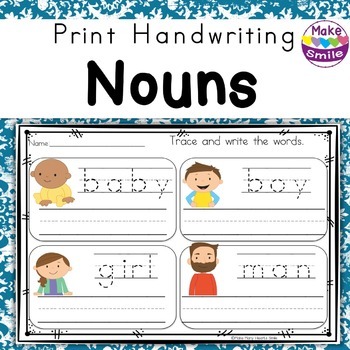 RamonaM Graphics, Fun for Learning, A Sketchy Guy, Marie Cole Clipart. Lindy du Plessis, Create by The Creative Art Teacher, Hello Literacy, Khrys Bosland, Fonts4Teachers, Zip a Dee Doo Dah Designs. Trioriginals, Graphics From the Pond, OldMarket, Creative Clips, Educlips, Jamie Harnar, Dancing Crayon Designs, Whimsy Clips, Kari Bolt Clip Art, Whimsy Workshop Teaching, Ashley Hughes, LittleRed. Blue Bees Workshop, Simply Secondary, RebeccaB Designs, Prettygrafik, Optimistic Kids and Families Art, Hidesy's Clipart, Pink Cat Studio, Lockless Creations. Ink 'n' Little Things, Alexandrienne, Kindercade, Rossy's Jungle, Teachers Resource Force, English Unite, Sarah Pecorino Illustration, Aisne's Creations, Clip Art Stand by Tina Anne. Sonya DeHart Design, Clementine Digitals, Prince Padania, TeaBreakArt, StellaBellaCliparts, Apples N Acorns, PoppyDreamz Digital Art, The Enlightened Elephant, TeachersScrapbook, Kelly Benefield. Kids Math Teacher, Technology Integration Depot, PinkPueblo, Pandas and Pencils, Lita Lita, The Candy Class, Lovin Lit, Learning in Wonderland, Teacher Laura, Free Your Heart and my own digital paper designs.